The Dharma name of the Venerable Master Xuan Hua was An Ci (Peace and Compassion), also known as Du Lun (Liberate [from the] Wheel [of Rebirth]). He became the Ninth Patriarch of the Wei-Yang lineage school of Chan after being granted the Dharma Seal of the Wei-Yang lineage from the Elder Venerable Master Xu Yun. The Venerable Master's Dharma-Transmission name was Xuan Hua (Proclaim and Transform), but he often referred to himself as "a living dead person," or "the Monk in the Grave." Throughout his life, he never wanted fame or profit, and he had even less desire to contend with others. Instead, he said that he would rather be "a little bug," or "a small ant" beneath the feet of all living beings, and let them use his body as a stepping stone to transcend from commoners straight to the ground of the Buddha. The Venerable Master Xuan Hua was a native of Shuang-Cheng County in Ji-Lin Province in northeastern China. He was born in 1918, on the sixteenth day of the third lunar month. His father's surname was Bai and his mother's maiden name was Hu. His father was a diligent, frugal, simple and honest farmer. 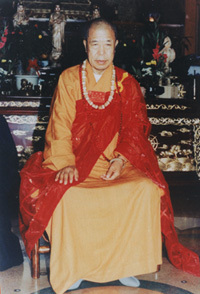 His mother was a vegetarian who recited the Buddha's name throughout her life. She gave birth to four sons and three daughters. Then one night, she had a dream in which she saw Amitabha Buddha emitting a light so radiant that it penetrated heaven and shook the earth. Shortly after, she gave birth to her youngest son. When the Venerable Master was born, the room was filled with a rare fragrance. For three days and nights the Venerable Master cried continuously, a sign of his deep sympathy for beings suffering birth and death in this Saha world. When the Venerable Master was a child, he followed his mother's example, eating only vegetarian food and reciting the Buddha's name with sincerity. When eleven years old, the Venerable Master came across a dead baby in the wilderness. Suddenly he was awakened to the major event of birth and death and the impermanence of all phenomena. Subsequently he resolved to leave the householder's life (i.e., become a monk) to cultivate the Way. In the following year, in order to repent for his obstinate disposition and to avoid bringing affliction and worry to his parents, the Venerable Master began to practice the Dharma door of bowing to his parents, to heaven and earth, to the emperor and to his teachers as well. He also bowed to all the great sages and worthy ones, to all the great filial sons and daughters, and to all the loyal government officials and patriots. He even bowed to all great wholesome people, and to all great evil people. His wish was that good people would be rewarded, and bad people would repent and reform. Twice a day when no one could see him, before anyone else woke up and after everyone went to bed, the Venerable Master went into the courtyard and quietly made eight hundred and thirty-five bows, which took about two and a half hours. Regardless of wind and rain, the Venerable Master continued to bow everyday without fail. He bowed and bowed in the hope that evil people would become good, that disasters would be transformed to good fortune and that world conflicts would give way to world peace. In addition to his bowing, the Venerable Master took excellent care of his parents; he observed his filial respect down to the very last detail from the moment his parents got up in the morning to when they retired at night. As time passed, he became widely known as "filial Son Bai." At fifteen, after receiving permission from his parents, the Venerable Master went on a pilgrimage to visit and look for Good Knowing Advisors. At the end, he took refuge with the Elder Venerable Master Chang Zhi of San Yuan (Three Conditions) Monastery and became a disciple of the Triple Jewel (the Buddha, the Dharma and the Sangha). While the Venerable Master investigated and practiced Chan (Dhyana) meditation, he also attended a private school. Benefiting from the Dharma door of single-minded concentration of Chan, the Venerable Master could recite a work from memory after having only read it once. When the Master was seventeen years old, although he had only two and half years of formal education, he had thoroughly mastered the Four Books, the Five Classics, and the lessons of the numerous schools of philosophy.He also learned other worldly dharmas such as medicine, divination, astrology and physiognomy. The Venerable Master worked diligently without being lax. 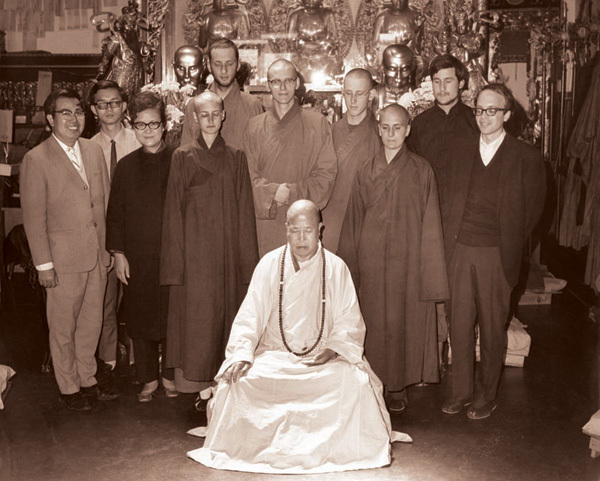 He dedicated himself to investigating Chan and studying the Buddha's Teachings ceaselessly, and thoroughly understood the transcendental Dharma. When he was sixteen years old, he resolved to lecture on the Buddhist Sutras, and to help those who liked to study the Buddhadharma but were illiterate. At age eighteen he left school to care for his mother, who was very ill. At the same time, he gave up his house and started a free school, teaching a class of thirty impoverished children of different levels and age groups all by himself. 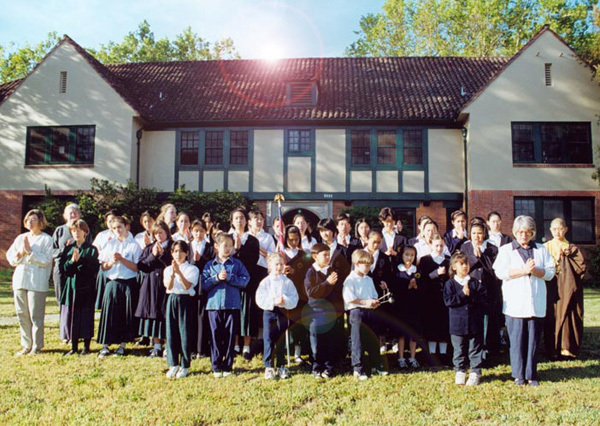 In addition, the Venerable Master joined many charitable organizations. He exerted himself to practice the great work of the Buddhas and Bodhisattvas in saving all living beings and aiding those in need. When the Venerable Master was nineteen, his mother passed away. Hence the Venerable Master put down all the myriad conditions. On the eighth day of the fourth lunar month (the anniversary of the Buddha's birthday), the Venerable Master respectfully requested the Elder Venerable Master Chang Zhi. from San Yuan Monastery to shave his head so he could leave the home-life. After the Venerable Master received the Shramanera (novice monk) precepts, he returned to live beside his mother's grave in a sorghum stalk hut for a three-year mourning period. The Venerable Master ate only one meal a day at noon and never lay down to rest at night. He bowed to the Avatamsaka Sutra, and performed repentance. As each day went by, his ability to concentrate become more proficient, and his compassion grew deeper and deeper. At age nineteen, on the nineteenth day of the sixth lunar month (the anniversary of Guan Yin Bodhisattva's attainment of the Way), the Venerable Master made eighteen great vows and resolved faithfully to achieve each one of them in order to relieve and cure all illnesses and sufferings of all living beings. He vowed to take upon himself all living beings' karmic obstructions created by ignorance, afflictions, and anger, so he alone would endure the negative retributions on their behalf. Moreover, the Venerable Master's actions were able to inspire and transform beings such as countless dragons, snakes, and fox spirits. They took refuge with the Triple Jewel and observed the precepts, changing their evil ways to cultivate the good. The Venerable Master had always helped out living beings, but he never helped himself. Throughout his life he had devoted himself to fulfill and perfect his eighteen great vows. The Noble Yun saw me and said, "Thus it is." I saw the Noble Yun and verified, "Thus it is." Universally vow that all beings will also be Thus. 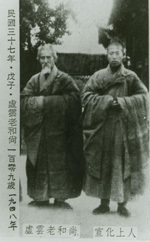 At that time, the Elder Venerable Master Xu Yun was 109 years old, and he recognized the Venerable Master Xuan Hua to be a "Dharma vessel of elephant and dragon (one who is worthy of the propagation of the Dharma)." He then asked Master Hua to be an instructor in the Nan Hua Vinaya Academy and an Acarya in the Great Precepts of the Three-Fold Platforms. He certified the Venerable Master, saying, "Thus it is. Thus it is." 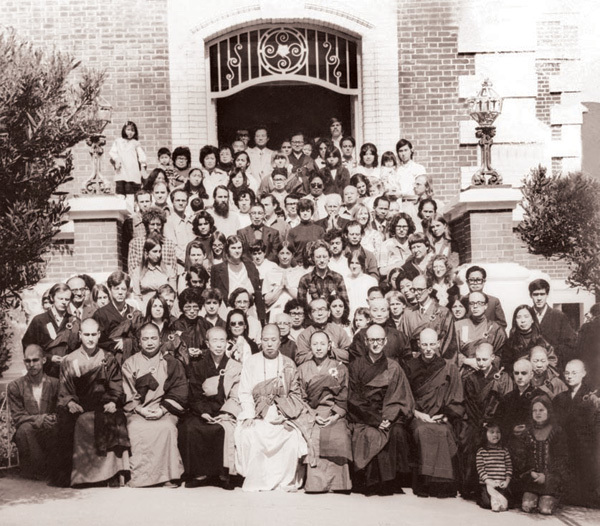 In 1949, after the completion of the Spring Precept Transmission, the Venerable Master bowed and bade farewell to the Elder Venerable Master Xu Yun and traveled to Hong Kong to spread the Buddhadharma. 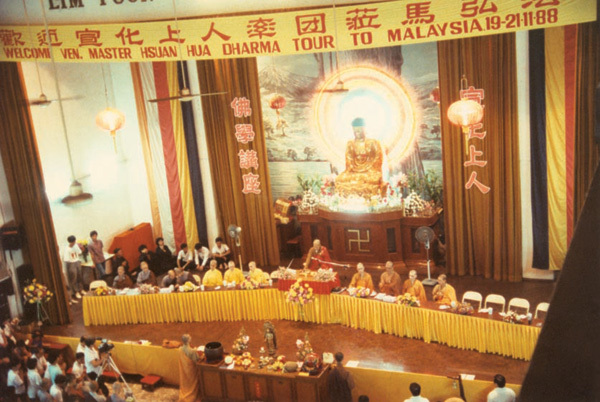 After his arrival, the Venerable Master impartially proclaimed and propagated the Five Schools of Buddhism, and helped rid the religious schools and sects of divisiveness. In addition, he renovated and reconstructed many ancient Bodhimandas (monasteries), printed sutras, and commissioned the making of images of Buddhas and Bodhisattvas. He also established Xi Le Yuan (Western Bliss Garden) Monastery, the Buddhist Lecture Hall, and Ci Xing (Flourishing Compassion) Monastery. In 1956, on the ninth day of the fourth lunar month, the Elder Venerable Master Xu Yun from Yun Ju ( Cloud Dwelling ) Mountain sent the Venerable Master a certifying document of the Wei-Yang Chan School. He appointed the Venerable Master as the 9th Patriarch of the Wei-Yang Lineage in China, the 46th generation in a line descending from Shakyamuni Buddha. He also bestowed the Venerable Master the name "Xuan Hua" (Proclaim and Transform). Proclaiming (Xuan) Wei's wonderful meaning causes the Lineage's teaching to be echoed far and wide. 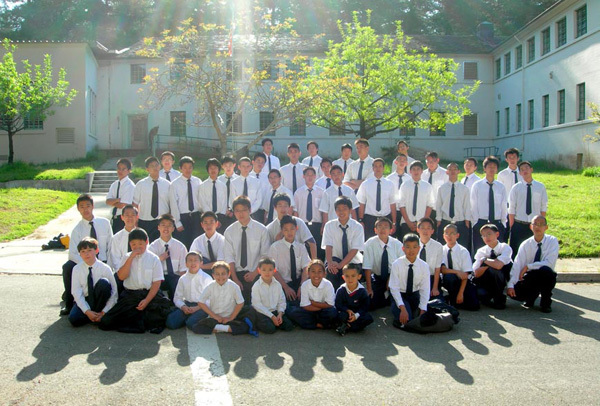 The transformations (Hua) inherited from Mt. Ling exalt the Dharma path. Taking across (Du) the forty-sixth, The mind seal is transmitted. The wheel (Lun) revolves unceasingly, rescuing all the suffering living beings. 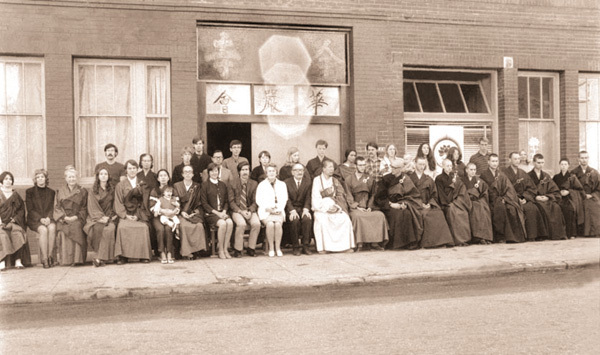 In 1959, some disciples of the Venerable Master in the United States established the Headquarters of the Sino-American Buddhist Association (now known as the Dharma Realm Buddhist Association). 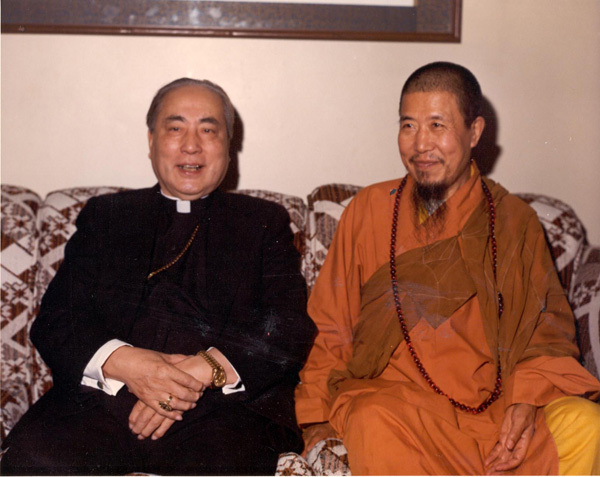 In 1962, causes and conditions matured and the Venerable Master accepted an invitation to come to the United States. 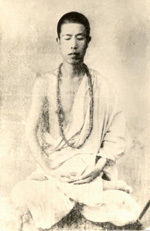 He then transmit the Proper Dharma to the Western countries. With the founding of a new American Sangha, the Master wan then ready to embark on an incredible building program for Buddhism in America. The Venerable Master devoted his life's work in three main areas: (1) propagation of the proper Dharma; (2) translation of the Buddhist Canon; and (3) education. As a means to propagate the Proper Dharma, the Venerable Master lectured on sutras and spoke the Dharma daily for several decades. He always explained the profound meanings in a way which was easy to comprehend. Furthermore, the Venerable Master exerted great effort to train all members of the four-fold assembly (monks, nuns, laymen and laywomen) to become proficient in propagating the Buddhadharma. 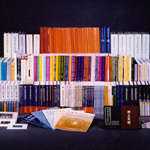 The year 1987 marked the advent of the World Religions Conference. 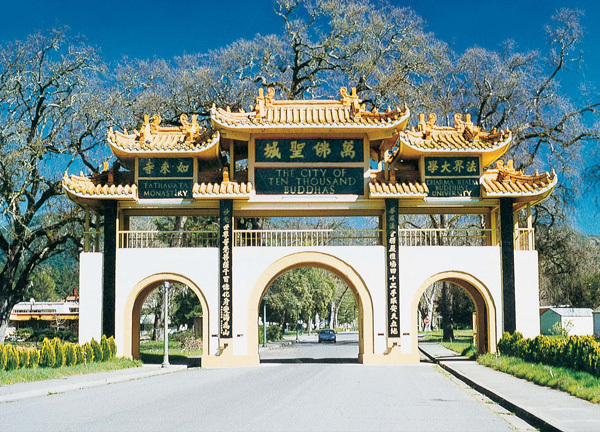 Leaders of the Buddhist, Confucian, Christian, Islamic and Taoist faiths congregated at the Sagely City of Ten Thousand Buddhas to explore solutions to societal problems in an effort to bring peace to the world. The disciples of the four-fold assembly throughout the Dharma Realm Buddhist Association's monasteries all strive to uphold the Three Great Principles and the Six Great Guidelines established by the Venerable Master. They use these principles and guidelines as a compass in their cultivation. They cultivate with vigor, following the Venerable Master's footsteps to advance on the Bodhi path. no fighting, no greed, no seeking, no selfishness, no pursuing personal advantage, and no lying. We renounce our lives to do the Buddha's work..
We take the responsibility to mold our own destinies..
Encountering specific matters, we understand the principles..
Understanding the principles, we apply them in specific matters..
We carry on the single pulse of the patriarchs' mind-transmission.. The Venerable Master dedicated his entire life to disseminating the Buddhadharma. Undaunted by adversities, he strove ceaselessly, and traveled to propagate the Buddhadharma in various Way-places, both in the U.S. and abroad. Based on the compassionate vows of a Bodhisattva, he rescued and crossed over living beings until he fell ill due to persistent overwork. Finally he collapsed from illness. After I depart, you can recite the Avatamsaka Sutra and the name of Amitabha Buddha for however many days you would like, perhaps seven days or forty-nine days. After the cremation, scatter my remains in empty space. I do not want you to do anything else at all. Do not build me any pagodas or memorials. I came into the world without anything; when I depart, I still do not want anything, and I do not want to leave any traces in the world. The Venerable Master said, "From empty space I came, to empty space I return." In fact the life of the Venerable Master itself was a mandala for the great Dharma wheel of the Avatamaska. Although he manifested Nirvana, he still constantly turns the Dharma wheel: "With great kindness and compassion rescue all. Spare neither blood nor sweat, and never pause to rest." We, the disciples of the four-fold assembly, can only practice according to the Venerable Master's teachings, and thus endeavor to repay one-ten thousandth of our teacher's boundless grace.